Do you need an industrial sewing machine? Take a good look in your basement and perhaps you already know the answer. Down there under the dusty covers and dark shadows, there are the many wounded soldiers of your exploits and garage sales. Unless you are an antique dealer or a collector, why would you want to clutter your home with any more unused machinery? Some women buy sewing machines like they buy jeans. Don't believe me? Run to your nail salon and ask around. You will find that the average women have 6 pairs of jeans, some will have more. I am guilty of this, at one point of my life, I had 12 pairs of jeans and 6 sewing machines (1 Singer, 1 Toyota, 1 Juki, 1 Janome and 2 sergers..). I'm not sure if you know, but Toyota actually does make sewing machines –as well as cars, trucks and just about everything else. Then I started to ask myself –what possessed me to accumulate so many pairs of jeans and this amount of sewing machines? The answer was quite simple, I was not entirely satisfied with the product. I kept looking for a pair of jeans that would look good and are comfortable, and I kept buying cheap ones in the hope that one day I will find the one. I did find a couple, but they never lasted more than a year, and I was left once again hunting for the perfect pair. Until one day I had to move to a tropical place. My needs changed and with it the need for 12 pairs of jeans. If I take 40 dollars and multiply it by 12, I have enough to buy a pair that is made with the best design and shaping capabilities. Like the need for a better pair of jeans, our need for a reliable sewing machine arrives in the shape of the mountains of projects forgotten and put aside because we were not happy with the look of the buttonhole or the zigzag doesn't work anymore or the machine is skipping stitches when sewing bulky items, etc. etc. Notice how after a marathon of sewing, your domestic sewing machine is never quite the same? This is because home sewing machines are not meant to be used for an extended period of time. Do you want a sewing machine that can do everything? Everything? Really..? What does that even mean? Can it attach lining on its own while playing Bach in the background? There is no such thing as a perfect sewing machine that does everything. With time I have learned that 95 percent of the stitches I will never use and that professional looking buttonhole is everything. Do you want to declutter your home by getting rid of mediocre machinery? 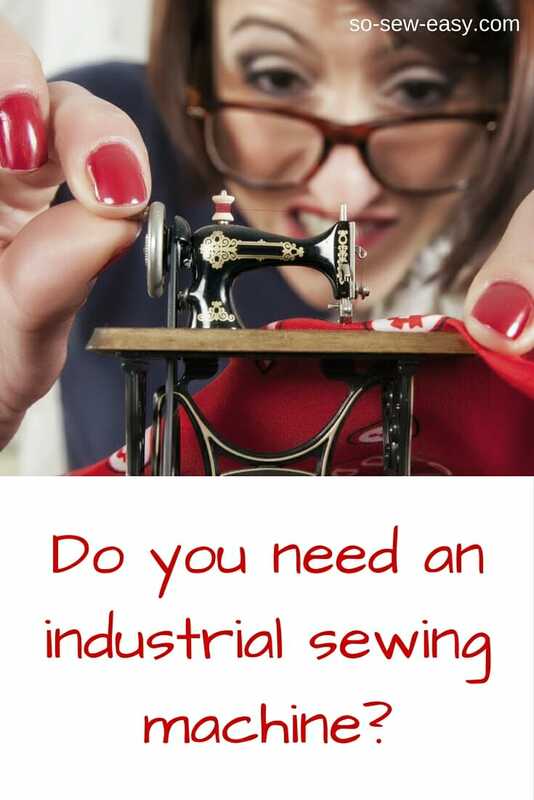 Do you want to supplement your income with your sewing and need a reliable machine with a professional looking stitch? Do you want to combine different types of material together for accessories? Do you work with canvas, jeans, leather or sequinned fabrics? Do you sew every day for more than 4 hours a day? Do you own an embroidery machine and are thinking of making quilts and handbags? As with my sewing machines, I traded my jeans for a nice pair of well-fitted dark color 7 for all mankind jeans slimming illusion –I like the illusion part the best– and, Yes, I have only one pair now. Expensive for sure, but worth every penny. How many sewing machines then? I think of machines as the brush of a painter. You can use your hands or have just one, but the true and full answer is 3. One serger, one domestic machine that makes flawless buttonholes, and my workhorse –an old Pfaff 563 that is reliable and noisy like a tractor, but it sews many layers of fabric together, thick leather and finishes the job efficiently and quickly. How many sewing machines do you have? Would you consider an industrial one? Do you have the perfect sewing machine for your needs? Leave a comment on the box below. We'd love to hear your opinion. 96 Responses to Do you need an industrial sewing machine? At the moment I own two machines. I only have the two, because my older machine is just that…older. I purchased an electronic machine and I am happy with it for my purposes. (Quilts and quilting, small projects and gifts for friends and family. I have only owned three machines in my life. The first being one I received for my sixteenth birthday, which I passed on to a friend in need and I think it is still going! Wow. Yes I need one. I have sewn for many years and my Singers and Bernina has held up although there are some struggles with layers and lots of sharp needles. So, after al this time I am Looking for that Industrial sewing Machine. I have often put in 8-12 hours a day 4 days a week. Depends on special occasions coming my way. Thanks for the tip it helped make my decision. Wow! Debra you do sew a lot! Love to see what you make. I am looking for a sewing machine that would sew fabric like the scuba diving material?? I use a regular industrial sewing machine (Juki, Pfaff, ect..) and it will bunch up and if I stretch it it tears where it was stitched, what I am covering is wheelchairs and some of the seats are hard to cover because of the deformities, and I stretch the material and glue down the material. Thank You for your time. HI Johnny, Have you tried a regular machine with a walking foot? Hi, Jana, there are second-hand alternatives, the key is to buy one that answers your needs. I have a second hand one, an old horse that can go through thick fabric like is nothing. I paid 600 dollars, it is not easy on the eyes and noisy compared to the newer ones but does the job marvelously :). Thank You for this article. I’ve been debating this question for the last few months. And the answer is : YESSSS I need an industrial machine. I was thinking of buying a home machine with a little faster motor etc… It won’t cut it. Nothing I sew is light duty. I have 5 machines now that are all good at different things. I really need a workhorse for sewing upholstery and hand bags. I’m thinking sailrite or one of the clones. I’ll also search for a good used industrial machine like yours. I disagree with the part about having many machines because one is not satisfied with what they have. I have 4 machines and a serger that I use regularly and am happy with them all. I like having multiples because I like sewing machines. One of them is perfectly sized for travel as well. I won’t have multiples of much of anything else, but so love sewing machines and think they are like art. I think I just blew up my Viking Sapphire 😩 I sew in average 3 straight hours each evening at full throttle…should my next purchase be industrial? I have 19 sewing machines and a serger. My absolute favorite? My grandmother’s Singer Treadle that I learned to sew on when I was 7….wouldn’t trade it for the world! I have brand new Brother but it’s just not the same. I get to sew and work out at the same time! LOL! I am perfect happy with my machine, which is a Brother CS 6000i. It is a quilting machine, but I have even used it to sew through outdoor fabric and jeans to make purses! It serves my purposes completely also because I hand embroider and know how to crochet. It takes a while for me to finish my projects, but binding even a king-sized quilts takes almost no time to do. I don’t have the space for an industrial machine, but that doesn’t stop me from dreaming about having the Brother Dream Machine II embroidery machine, since I could put my own images into it and embroider much faster than I can do by hand. I just cannot afford it (yet). I hope you will soon, sounds like yo found a gem. I will have to have a look at your machine. I have been a machine hoarder! I do think that I need a used industrial machine! I enjoy making bags. The last one I made (a carryon weekender) had many layers and felt close to the limit of what my beloved Janome MC8900 could manage to sew through with a 120 needle! I do love my Janome MC8900 and it close to being the ‘perfect’ machine for me. I have a Babylock Imagine serger that I love and a small, lightweight, Janome for classes. Only 2 machines of which 1 is heavy-duty for sewing coats & purses. Miss my machines while I transition. I need an industrial sewing machine, as I’m trying to start my own bag making business. I have four domestic sewing machines but they just can’t handle thick and multi layer tasks. Problem is, I don’t know what to buy….. I design and make bags on a consistent basis in my free-lance design business. My workhorse for all my heavy duty projects is a Brother LS2 walking foot machine, this machine is capable of sewing belt leather, which I have done. Cost will be from $1000 to $1,800 new. But for 20 years I had a Singer 111 walking foot that you can get on Craigslist for 300 to 500 bucks; it doesn’t have a reverse, but those vintage machines can sew just about anything to do with bags, and you can get parts and accessories easily on the Internet. An industrial walking foot is what operators use in a factory 9 hours a day, 5 days a week, so you can’t go wrong using one in your home. Yes industrial sewing machines are an aloof bunch and takes time to know them, once you do will become the star of the show. You have great equipment! Many machines make that claim, but they never deliver. Hope you find an industrial machine you are happy with. and i love them all. Each is special. All except my pfaff select 1530 are set up for regular use. The pfaff select 1530 needs to have the needle position calibrated. The centre position is not at the centre. i suppose that qualifies me as a sewing machine junkie. i have been collecting them since 1993. WOW! And I thought I had a few.. You must have a favorite though? Well Mayra, maybe i have a few. I love the pfaff 1163 industrial for it’s speed, gusto and beautiful consistent straight stitches….the bernina 380 for the convenience and variety of functions offered without compromising on it’s beautiful stitch quality…….the pfaff quiltstyle for it’s beautiful stitch quality and integrated dual feed system (a winner with napped fabric and multiple layer stitching)……the singer treadle for free motion embroidery (beautifully forms stitches….so organic…i could go for hours because treadling allows me to set my own rhythm)….and the juki tl-98p is the latest addition to the fleet….still on honeymoon….but i am sure it will be a favourite too. As for the overlocker…the pfaff 4842 is my favourite because it is unfussy and it purrs softly while giving beautiful balanced stitches every time…. with minimum or no tweaking at all. I would use the Siruba 747D whenever i have loads to overlock…..the speed cuts the time more than half. I guess i collect them all because i need the right machine for the project. I make garments (with woven and knit fabrics), bags (combining fabrics with genuine leather trimmings), quilts and curtains. I also up-cycle stuffs (old banners, plastic bags, tarp) into useful homedec items and bags. Rather than like buying jeans, mine is more like buying shoes….i would like to have a few shoes that are comfortable to wear so that i can rotate them…..they will last longer and i am guaranteed of happy feet every time. Sounds fair? I have two sewing machines, a singer 1941 model 66, a seammaster by simplicity and a serger. I want to do some jeans and leather work and would love to have a treadle, but I’m not sure where I would fine a working one at a reasonable price. Can anyone tell me where to start looking in the Ohio area? I have my husband’s grandmother’s (and later his mother’s) fully operational Singer treadle, my mother’s 1950’s Singer, my own Singer Touch N Sew, a Singer teacher’s model, a Singer Featherweight, a Bernina serger (70s), a 730E Bernina, a Viking Serger, a Viking Diamond, my dad’s old portable Singer, my mom’s Touch N Sew (for parts). I am so happy that I am not alone in my sewing machine ‘hunt & gather’ collection. Unfortunately, I tend to buy machines. I love old metal machines – true workhorses! But let’s just say that I currently have 5 set up in my workroom…. This does not include those that are in the attic or in the husband’s workroom. My husband thinks I am in serious need of a support group. Who out there wants to join me? I have three sewing machines and a Babylock Eclipse 2 serger. My Kenmore sewing machine was a gift for my 16th birthday in the 80s. In 2012 I purchased a Brother Innov-is 1250D. Two years ago I was gifted a Husqvarna Designer Diamond. I switch between the later two weekly, depending on the project. Recently I began considering the need for an industrial sewing machine. The verdict isn’t in yet. I truly miss my old Singer treadle that I bought in 1973 as my first BIG purchase after marrying. It did all the heavy work and the light work without a worry. Silly me thought all machines sewed that well when I let my husband trade it in for a zig zag machine in 1981. I still have and use that machine a Janome SR 2000. It is used for all weights of fabric. I sewed all my baby clothes and maternity clothes on the old treadle. I loved it but I wanted to be able to do zig zag. It was second hand from a lady who made sails for her husband’s yacht on it. The other machines that I have bought have all been brand new, even the 2 that were sold or traded in before the Husqvarna was bought. The only one I do not use a lot is the overlocker. I tried to kill it 18 months ago. It has been repaired and serviced, but now I feel intimidated by it. One day when the towels all need their edges redone, I may start to use it again. I have a Janome 8050XL, a Janome 8002DX which I bought together last summer in an Amazon.co.uk offer. I also have a Brother which I use just for twin needle sewing and leave it set up permanently for this since the Janome seems not to do this. And I also have a small machine which I cannot remember the brand of but is some shops own brand and was very cheap. My mother gave it to me. It is meant to just do zigzag and straight stitch and four-stage button holes and is currently unused because I cannot find how to stop it skipping stitches and the thread jamming up. Possibly it is worn out but it has hardly been used. It simply doesnt want to work for me it seems. Try rethreading the machine that is having skipped stitches, top & bobbin, and don’t forget to put in a new needle. If that doesn’t work, try having it serviced. also try good quality thread. some machines dont like the cheap threads. I have 5 sewing machines, a treadle, a $99 Singer from the late 60s, the thread would always tangle on that one though I used it for years. I gave it to my daughter and got it back, now resides in the basement. Another from the 40s with a button hole attachment that is amazing though haven’t used it in forever, it resides in the attic. # 4 is sitting on top of it, a $200 machine that was a total bust. Now I use a Brother machine that my son picked up at a black Friday sale about 15 years ago for $49. It is a dream, the best machine I have ever had. I do Dress a Girl and make things for my grand daughter and grand son. It gets a good amount of use, is basic and, knock on wood, has never let me down. The sewing, I do, is pretty straight forward, so I am happy with it. I never realized, before that I am a collector! I have a working treadle, (my mother’s) 4 all purpose machines, (2 purchased new and 2 used) and 3 sergers (2 used and one still in the box, but bought at a garage sale) Each has its use and I frequently trade off. I sew frequently, mostly re-purposing and repair, some upgrades in window treatments. , and crafting. How do you like your treadle machine and can you sew denim and leather on it? Never thought of an industrial machine until reading this article. I update machines every 5 years, but services are every 2 months. Trouble is industrial machines in Australia are very expensive. Even second hand ones are costly. Hi Kaye, it may take a little time but industrial sewing machines come up from time to time in Australia on Ebay. Also, keep an eye on Graysonline.com. Not sure what city you’re in but there’s a Juki on auction in Sydney at the moment. I have 3 sewing machines and like you they each have their task, plus i have an overlocker. I think an industrial machine would be amazing, but where coukd we find one and how much are they likely to cost. Dont they run on air pressure? Any sewing machine that uses air pressure most likely will have automatic thread trimming. You can imagine how much this feature would speed up production in a factory setting, especially on a coverstitch machine. Don’t be afraid of an industrial machine, they’re fast, but you get used to it, and when you sew on a home version, you ask why is this machine so slow! I have six sewing machines and a serger (old without differential feed). No longer have an embroidery model, as in mid-80’s we bought one that had ABSOLUTELY TERRIBLE tension (the dealership had used nail polish to fix the tension discs –yeah, they actually said that to us– when we had servicing done shortly AFTER the warranty ran out). Pardon me, but I thought being able to achieve good tension on a straight stitch was a BASIC NECESSITY in a sewing machine (I guess some dealerships don’t think so). Never bought another embroidery model–took up free motion embroidery / threadpainting instead. I’ve worked on an industrial sewing machine for an designer upholstery class that I took around 2001. I think I might consider acquiring one–but do have a good basic heavy duty machine–a White “Jeans machine” which has a strong motor and retains good tension even after hours of use on a daily basis for weeks. I think without that basic good machine, I’d be much more drawn to looking for a good used industrial model. Nothing replaces good quality stitches! I also have 4 sewing machines, a 1960’s Singer 401A inherited, a Baby lock Embrodrery, a Viking regular and a Viking Serger, love all of them but would like to get an industrial machne to be able to sew the handbags and make money at that. I have a Janome 1600P semi-industrial. I love it! It seemed to be a fair compromise, I don’t sew enough to warrant a full on industrial but needed something robust & didn’t want a hundred embroidery stitches that I’d never use. 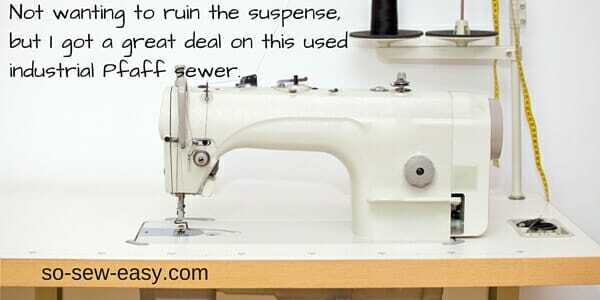 It is a plain sewer only so still need another machine for button holes for which I use my old Janome 16 stitch but would like to trade that for something newer. (what is the perfect button hole machine?). I also have a Mercury overlocker.